Last weekend, our children not only had a really great fun but also learned a lot! One of our sponsors invited Crimson Education and White Room Charity to Baan Unrak Children’s Home to run some excited activities with our children. Crimson Education and White Room Charity are experts of education and children. The activities are design in a game form to teach children real knowledge. The activities overall goals are to … Continue reading "Last weekend, our children not only had a really great fun but also learned a lot!" The most extraordinary experience – Baan Unrak Children Visit Italy. Travelling is very restricted for our community. Most of our children and adults do not have official travel documents and even to leave our very small town is a very difficult enterprise. 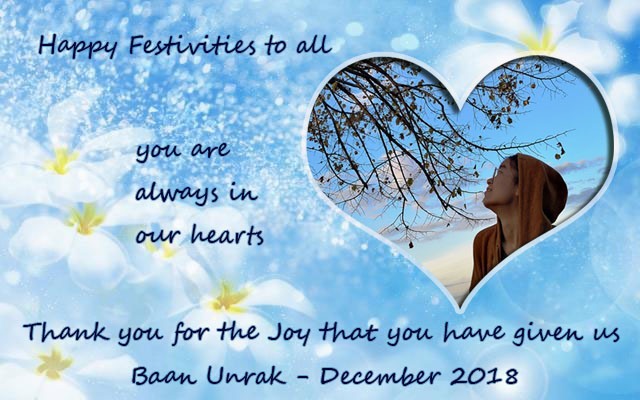 When some of our sponsors offered tickets for some of Baan Unrak’s children and staff to visit Italy, we did not believe such … Continue reading "The most extraordinary experience – Baan Unrak Children Visit Italy." The total number of people suffering from lack of food world wide is over one billion. Food waste or food loss is food that is discarded or lost uneaten. The causes of food waste or loss are numerous and occur at the stages of producing, processing, retailing and consuming. Global food loss and waste amount to between one-third and one-half of … Continue reading "The Perfect Match!" There is always an everlasting love for Baan Unrak and even more so if it has been your home for nearly 19 years. This is the case for Kamala, who came to visit with some of her colleague’s from Luangta Noi Foundation, giving back a little of what her home had given to her. Kamala … Continue reading "Happy Home Coming!" It has been just over a week since Didi left to go to Italy to do some fundraising, attend seminars and meet with governmental officials. More to follow….. The week started with the children having to go back to school. Like most children who like to test their limits when their parents are away from … Continue reading "Whilst in Italy"